It’s been too long since my last post on the Mood Sewing Network. I was so happy when the rain stopped. Being so anxious to show you my latest sewing project, I quickly got ready to take a few pictures outdoors. This jumpsuit was half finished for about two weeks. Friday evening I was determined to finish it. This lovely brown, black, and white striped rayon twill was purchased several months ago from Mood online store. It’s still available. It has a smooth hand and it’s floaty. Perfect for the summer time comfortable. This new jumpsuit is perfect vacation sportswear. Of course, it’s good to wear for Saturday lunch with the girls or a nice stroll in the park with your better half. Rayon is easy to press, but does wrinkle a bit. No worries with this fabric. The stripes makes them barely noticeable. The pattern that I used to make it is Vogue’s very easy 9260, copyright 2017. I think I bought it last year, but I hadn’t decided on how I would style it. 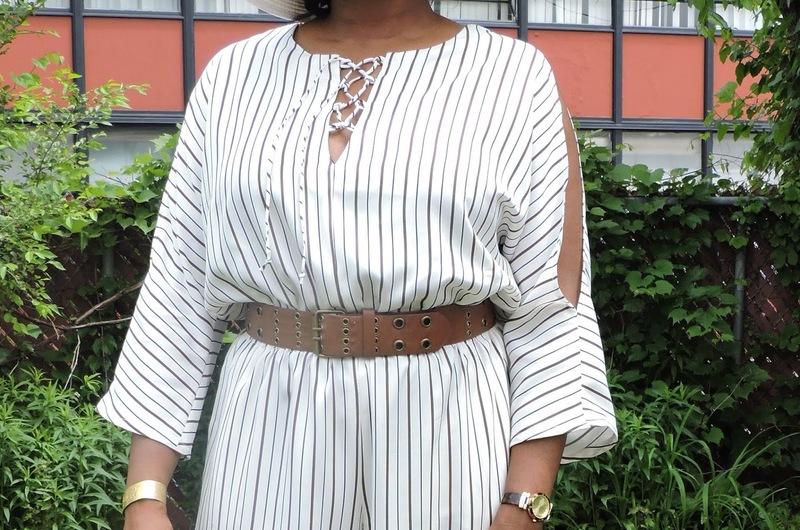 The description is very brief: very loose-fitting pull on romper and jumpsuit have cold should and length variations. The “cold shoulder” description shoulder be “cold arm” instead. It comes in two size groupings: XS-S-M and L, XL,XXL. The second grouping was the only copy at the Orland Park JoAnn’s. So I just bought it with the thought of adjusting it as needed. So I used the large and scaled it down. I guess somewhere between a medium and large. As the large was much too big for me. This pattern has a lot of style ease. The finished bust is 48.5 inches and the finished hips is 50 inches. Both well above my measurements. I scaled it back at least 4 inches in both areas. My finished jumpsuit looks similar to the drawing. I don’t think the “cropped” pants is quite the look for me. So I lengthened the pants by several inches so that the hem falls around the heel of my shoes. Outside of that it does look like the drawing. I like the style of it. The drawstring, the cold arm, and the wide pant leg. No real dislikes. I did make a few more changes in the construction of it. Instead of purchasing cording, I made my own. Cutting the fabric on the bias about an inch wide, two pieces 12 inches long for the loops and one piece 20 inches long for the drawstring. Plus it is a perfect match for the jumpsuit. I added 1.5 inches to the length of the bodice. The raw edges were serged. To finish the cold arm opening I only turned the cloth once. So you can see the serged edges. The instructions say to cut the elastic the measure of your waist plus an inch. I cut it 5 inches smaller. I will make it again. I think I will use the bodice and make a skirt waist dress instead of a jumpsuit. I do recommend this fabric and the pattern to others. The fabric is perfect for those fun floaty summer projects that you might be planning. The pattern is very easy and does not take long to sew. Side Note- I was a little worried about how the photos would turn out. I had a chemical facial peel and laser hair removal less than 24 hours before the pictures were taken. I’m glad that they were publishable as I didn’t want to wait another day before posting something to the Mood Sewing Network blog. Happy to be back sharing my sewing adventures and hope to post again this month.